The University of Toronto will address a critical need for on-campus housing, innovation space and other services with a plan that also creates a future source of revenue to help fund U of T’s academic mission – and contributes to the vitality of the city’s urban fabric. The approach is laid out in a policy framework dubbed the “four corners strategy” that goes before Governing Council’s business board for approval today. It’s meant to guide the university’s thinking as it goes about building new non-academic amenities and services on the periphery of U of T’s downtown Toronto campus, as well as at U of T Scarborough and U of T Mississauga. “Four corners is about building sustainably with quality designs and enhancing the public realm,” says Scott Mabury, U of T’s vice-president of university operations. Examples of such forward-thinking projects include a new highrise residence at Spadina Avenue and Sussex Avenue, the first new residence built at U of T in nearly two decades, and a proposed 14-storey innovation centre at the corner of College Street and University Avenue – right across from the MaRS Discovery District. “Because these are commercially viable projects – the innovation centre will house startup companies and corporate research partners – we anticipate being able to generate financial returns for the institution that can be used toward future academic investments,” Mabury says. U of T has set an “ambitious goal” of generating $50 million per year by 2033 through the development of roughly 3.5 million square feet of new space devoted to campus services and amenities, which also includes office and retail spaces, according to Mabury. The money will be used to create a strategic investment fund to advance U of T’s mission in research and teaching. Down the road, the plan is to eventually match the annual revenue generated by U of T’s endowment, Mabury says. The new framework, dubbed “four corners” to reflect its broad application across U of T-owned lands in Greater Toronto, also calls for “thoughtful planning and design” of all projects to encourage a porous campus edge and engagement with local communities and the city more broadly. 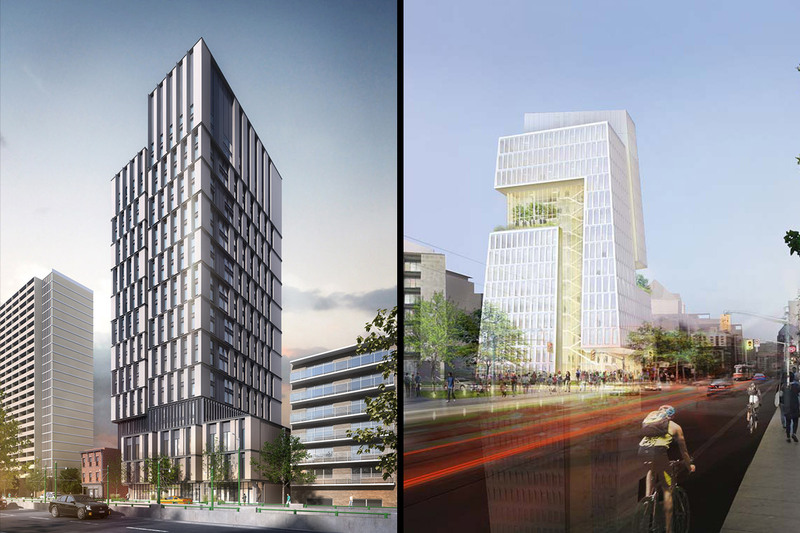 The proposed U of T innovation centre, for example, is a striking, sloping tower that sits atop a soaring, glass-walled atrium – an effort to welcome the public into the building and connect those inside with the city beyond. The centre’s interior, meanwhile, is designed to encourage collaboration between researchers, entrepreneurs and corporate partners through the inclusion of airy public spaces, including some that stretch vertically between floors. “I think it will be a magnet for people who want to drive innovation,” says Mabury of the building designed by New York’s Weiss/Manfredi Architects in collaboration with Toronto’s Teeple Architects. The new 23-storey student residence, meanwhile, is one of several residential projects U of T is expected to undertake in the coming years as it grapples with a shortage of as many as 2,300 spots for on-campus housing. Scheduled to be completed in 2021, the slender tower – developed in partnership with The Daniels Corp. – will house 511 students while re-invigorating a tired stretch of Spadina Avenue with lively store fronts and cafes. “Many of our buildings when originally constructed, going back decades or longer, tended to look inward to the institution,” explains Mabury, noting U of T and its federated colleges maintain over 80 heritage buildings – most of them on the downtown Toronto campus. U of T’s “four corners” development strategy is unique for another reason: U of T is leveraging its considerable experience in designing, developing and managing buildings to keep its real-estate development work in-house. In a move that is unusual among post-secondary institutions, Mabury says the university wants to maintain as much control as possible over the properties it develops so it’s in a position to reap the most benefits. That includes maximizing the revenue generated from its properties and ensuring the buildings constructed on campus will be beautiful, functional and sustainable, serving U of T – and the city – for decades to come. “We can do a better job because we’re thinking hundreds of years down the road, whereas the private sector is thinking about the next quarter,” Mabury says. “Frankly, that’s not in our interest. Our interest is to build buildings that will last hundreds of years and use the absolute minimum amount of energy.